Stiller Cobra Drop Port, Right Bolt. Chambered in 220 Beggs .250 NK, 1:14″ twist, Jewell trigger, Beggs skeleton stock, Beggs Tuner. Built by Gene Beggs. Will shoot in .1s and .2s (can be verified). Includes 125 pieces of formed, fired brass, and sizing die. Scope and rings in photos are not included. $1900 insured & shipped in CONUS. CLICK HERE for details. 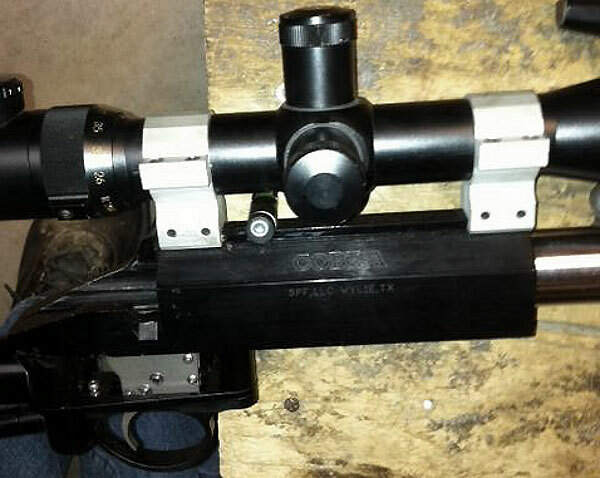 Even if you are not a benchrest competitor, this would make a wicked Prairie dog rifle to be shot off a portable bench. Having shot a Beggs “Tinkertoy” rifle with Gene himself, this Editor can tell you the “stockless” concept can work, and the Drop Port action is a joy to use (I own a Viper-action benchgun myself). The Greyfox rifle is a .220 Beggs so it is ultra-easy to form brass from the parent .220 Russian case. Whoever buys this unique, easy-to-shoot rifle will get a heck of a lot of accuracy for $1900.00. We were impressed with the 220 Beggs cartridge. It’s basically a plain 220 Russian with a sharper radius at the neck-shoulder junction. Gene Beggs has commissioned a 220 Beggs reamer with matching seating and full-length sizing dies. The little cartridge achieves 3600+ fps with a 52gr bullet, pushed by Benchmark powder. From what we could tell during our visit with Gene Beggs in Texas, the 220 Beggs is easy to load for, and performs exceptionally well with either turned (.250″) or no-turn necks. The recoil was noticeably less than a 6mm PPC, making the gun a joy to shoot. This round, we felt, could also be an outstanding varmint cartridge. The velocity is there, and we don’t think any other 22-caliber varmint cartridge is going to beat it for inherent accuracy. Photo shows bag-rider on Gene Beggs’s own .220 Beggs rifle that we shot in Texas. 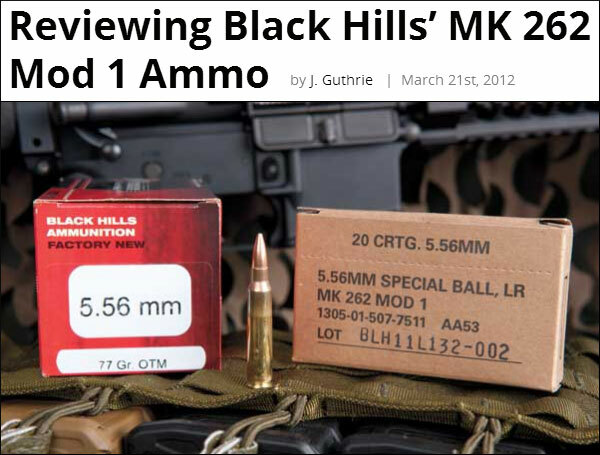 Share the post "Greyfox Has a Cobra Skeleton for Sale"
If you shoot Service Rifle, or use a .223 Rem at medium to long range, you should read J. Guthrie’s ShootingTimes.com review of Black Hills MK 262 Mod 1 ammunition. Originally developed for military applications, this very accurate ammo is now available for civilians to purchase. It uses a special Sierra 77gr MatchKing bullet with cannelure. Black Hills did extensive testing to develop this ammunition, shooting over 250,000 test rounds with various propellants and projectiles. Eventually, the Sierra 77gr MK bullet was chosen, with a powder that delivers 2750 fps MV (from a 20″ barrel). Story idea from Grant Guess. We welcome reader submissions. Share the post "Black Hills MK 262 Mod 1 5.56 Ammo — Now for Civilians Too"
Shooting heavy-duty steel targets is fun, and it’s a great way to practice your long-range skills, IF the target is the right size AND if it’s situated at appropriate distances. Unfortunately, many ranges don’t have steel rifle targets, or if they do, the targets are big gongs fixed in place. You can bring your own steel gongs to the range, however most setups are big, heavy, and hard to transport. Gongs are typically held by chains attached to very heavy, sawhorse-style supports that take two people to move. Now there is a portable steel target plate that is relatively easy to move, and which is available in appropriate sizes for precision rifle shooters. The AR550 heavy-duty version of the Evil Roy Practice Target from GSS Competition works great for precision rifle practice at distances beyond 100 yards. And you can use the same plates for pistol practice at shorter distances. To reduce the chance of ricochets, there are no exposed bolts or clamps, and the target plate head is angled. When using the targets with rifles you want to avoid any bullets with penetrator tips, and GSS recommends keeping velocities under 3,000 fps. That still allows you to shot .308s, 6BRs, 6.5x47s, and .284s at competitive match speeds. The GSS circular targets, made from AR550 armor plate, come in four diameters: 6″, 8″, 10″, and 12″. We like the 6″ size for shooting at 600 yards, and the 10″ plate for 1000 yards. These sizes are very close to 1 MOA at those distances. This provides a good challenge for an F-Class or high power shooter. The circular plates can be mounted at two different heights, up to roughly 36 inches above the ground. The head of the Evil Roy Target will “bounce” a little when you hit it, so you get instant feedback. 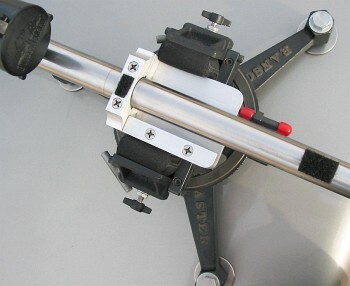 The GSS “Evil Roy” target plates are supported on a folding three-legged steel stand. This tripod base folds up to a 3-foot-long package for ease of carry and transport. NOTE: No tools are required for assembly, use, or storage. The portable stand folds to less than 3 feet long in just seconds, so it easily fits in the trunk of a small car. The GSS Evil Roy portable steel targets start at $155.00 plus $20.00 for the heavy-duty option. For a limited time, GSS is offering FREE Shipping on its steel targets (offer subject to change.) For more info, visit www.GSSCompetition.com. Share the post "Portable, Tripod-Mounted Steel Rifle Target Plates from GSS"